Jacob Steele: What do you see as the visionary artist’s role, and what do you seek to communicate about life in relation to the polarities of dark and light? Alex Grey: The artist is a lens for the soul. Artworks are the views seen through that lens. The artist’s subject dictates where the lens will be focused. Light is the core subject in our work. We are painters of transcendental light. Allyson’s paintings are abstract expressing a world view of essentialized consciousness through spectral light and secret writing. My art is figurative, portraying states of consciousness throughout the hero’s journey. Allyson Grey: The responsibility of the artist is to be true to their own soul. The mission of art is to make the soul perceptible. Polarities infuse our art and life: light and dark, chaos and order, bright colour and grey monochrome, man and woman, old and young, life and death. Polarities reflect the paradox of our mortal existence in relation to our timeless spirit. Spiritually inspired art is infused with devotional love energy, transferring to the viewer a sense of the sacred that makes life worth living. JS: The Chapel of Sacred Mirrors (CoSM) is a project to which you have devoted many years. What is CoSM’s mission? Alex Grey: The mission of CoSM is to build an enduring sanctuary of visionary art to evolve the creative spirit and uplift a global community. CoSM is a radically welcoming interfaith art church, a context for a community that honours and practices art as a spiritual path. 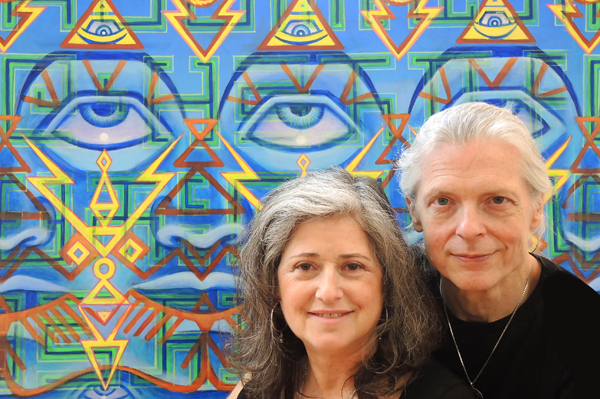 To further the spiritual practice of art, CoSM offers workshops and cultural programs. At CoSM, we celebrate commitments of love and passages of consecration including weddings, baby blessings and memorials. Grey House is filled with art and altars. The Wisdom Trail through the woods features natural beauty, altars, a labyrinth, a reflecting pond, murals and sculptural installations. Overnight stays can be reserved in Grey House, CoSM’s 10-bedroom guest house, 365 nights of the year. CoSM offers an inspiring destination for souls seeking to align with creative source, co-create a mighty force field of compassion and manifest sacred space together. Allyson Grey: Now under construction, targeted to open December 2017, is Entheon, CoSM’s sanctuary of Visionary Art, where visitors will experience an exhibition of mystic art inside a sculptural building. The All-One Gallery at Entheon will feature an annually rotating exhibit of original paintings, sculpture and muti-media by the finest artists of the International Visionary Art movement and there will be a gallery featuring many of my paintings and works on paper. Designed by Alex, Entheon will display many of his best-loved works including the Sacred Mirrors.